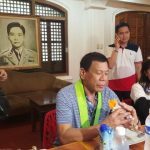 LAOAG CITY, Philippines – In the heart of Marcos country, Rodrigo Duterte said that, if elected president, he will allow the burial of former president Ferdinand Marcos in the Libingan ng mga Bayani (Heroes’ Cemetery). “My decision will be to allow his burial in Libingan ng mga Bayani,” he said during an ambush interview just a few steps away from the late Marcos’ remains in the Batac Marcos Museum and Mausoleum on Friday, February 19. “Because he was a great president and he was a hero…He had the idealism, the vision for this country,” he said of Marcos, who was president of the Philippines from 1969 to 1986, but whose final years in power were marred by an abusive dictatorship. Asked about widespread condemnation for the Marcos regime due to human rights abuses, ballooning national debt, and corruption, Duterte said Marcos was a “human” who made mistakes. “We all have our faults. Every human being [is] fit to fail…People see nothing but mistakes. People judge best when they condemn. You are at your best element when you are speaking ill of your fellow man,” he said. Duterte had previously said that, if not for the dictatorship and abuses, Marcos was the country’s best president. He added that Marcos’ dictatorship “remains to be debated” but his government programs and projects have stood the test of time. “All the things Marcos has built are still standing…Biyayang Dagat was good. Masagana 99 was good. He gave it to the people, this is the blueprint,” he said. Biyayang Dagat and Masagana 99 were fisheries and agricultural programs, respectively, that were implemented during the Marcos presidency. Imee Marcos, governor of Ilocos Norte and the eldest child of Ferdinand Marcos, stood beside Duterte as he explained his plan for her father’s remains. “We’re very very grateful. Certainly, we’ve waited a long, long time and I think this kind of healing will finally unify this country and make this nation great again, as someone said,” she said in reaction to Duterte. Duterte had a warm reception during his first visit to Ilocos Norte as a presidential bet. 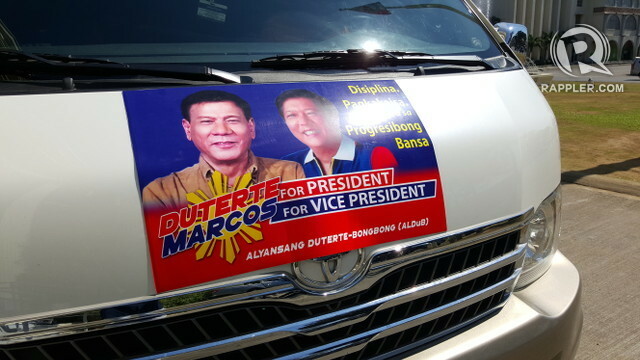 Main roads were lined with Duterte posters, and noticeably, posters promoting the tandem of Duterte and Senator Bongbong Marcos, the son of the late dictator who is now running for vice president. 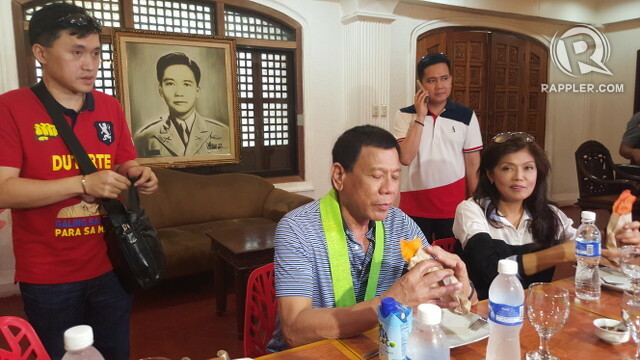 Imee Marcos and Duterte were inseparable for the better part of the Davao City mayor’s visit. 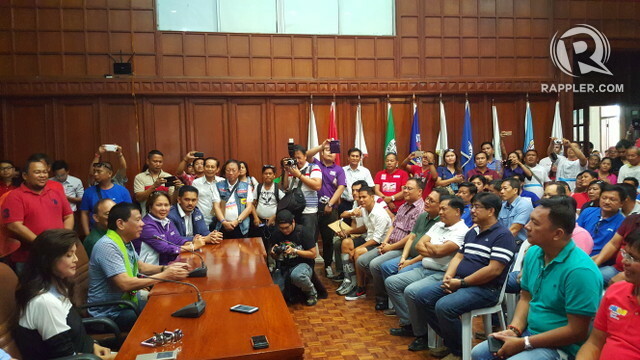 After receiving him in the Provincial Capitol, Marcos introduced Duterte to Ilocos Norte mayors and vice-mayors. They then proceeded to the Marcos Museum and Mausoleum where both paid their respects to the remains of the late dictator. Is the Ilocos Norte governor endorsing Duterte even if her brother is running with a different presidential bet? “Well, Bongbong is running with Miriam [Santiago] so obviously there’s that, but Digong is a good friend and everyone is welcome to come to Ilocos Norte,” she told reporters. Bongbong had asked to run as Duterte’s vice president for the 2016 elections. But Duterte chose Senator Alan Peter Cayetano instead. Cayetano did not attend the Ilocos Norte sortie. Ilocos Norte is home to almost 380,000 registered voters, according to the Commission on Elections. Duterte’s statements on Marcos comes 3 days before the anniversary of the EDSA Revolution, the people power movement that led to the dictator’s fall.